275.00 The magician shows a beautifully decorated box. It is open at the top and bottom and the audience can see all the way through it. 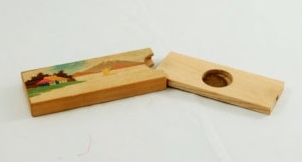 The box is placed on a thin wooden base. Immediately the magician can reach inside the box and produce a large array of silk handkerchiefs, spring flowers, and other items. The box is once again shown empty and placed back on the base. The magician then reaches inside and produces two live doves, guinea pig, rubber chicken, spring animal, or other large item! This classic Abbott’s Magic effect was created by Bud West and can be performed completely surrounded. 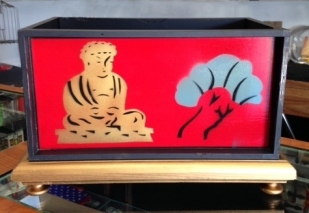 The box is approximately 15" x 8 1/2" x 8" making this production apparatus great for the stand-up or stage performer. We have only one of these classic items in stock. It is an older piece of apparatus but is in very good condition. 25.00 The magician displays a coin, which he then places in the wooden coin slide. The slide is then placed into its corresponding wooden box. When the slide has been removed, the coin has disappeared! Or a coin can be made to appear or change from one coin to another. We recently acquired several of these vintage Magic Coin Slide tricks. Each is handmade from wood, and made in Japan in the late 1950's and early 1960's. Very hard to obtain, each is artistically hand painted with Japanese motif. No two are alike. Each one comes complete with a small cardboard box and typical "bad English" Japanese instructions. If you are not a collector, don't order this. We want these to go into the hands of individuals who will preserve them for posterity. 250.00 Ok collectors, here's one you might not want to pass up. This is a vintage Vanishing Alarm Clock and we don't know the time period or manufacturer of this item. We can tell you that it is old. It is well-made, and the black art ribbon shows a lot of natural fading for something made a log time ago. 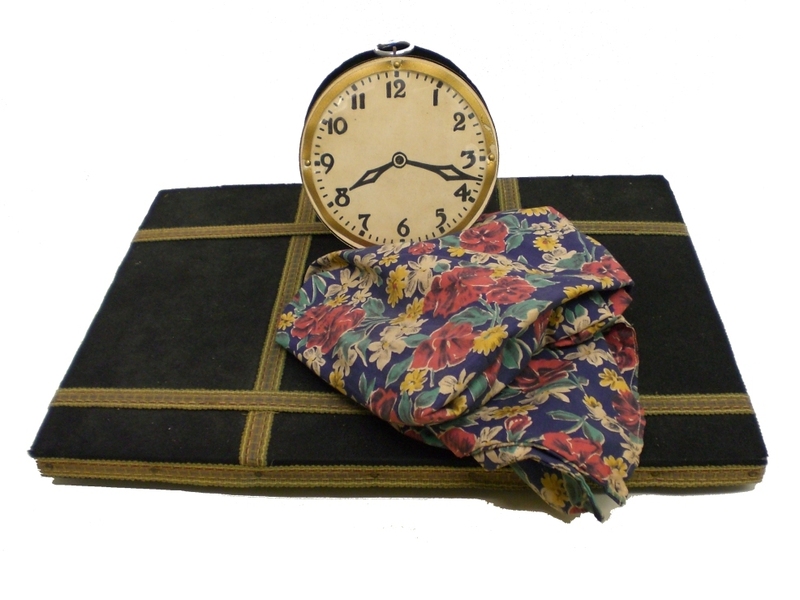 The handkerchief features the traditional gimmick. Note that this is not the "improved" vanishing clock whose face can be shown apparently in the hank immediately before the vanish. Also we need to tell you that the bell mechanism that is supposed to ring right before the clock's vanish no longer works. We are not sure if it can be repaired or not. So in all, we have this item priced low for its vintage. If anyone can help us with the identity of this piece, please e-mail us. 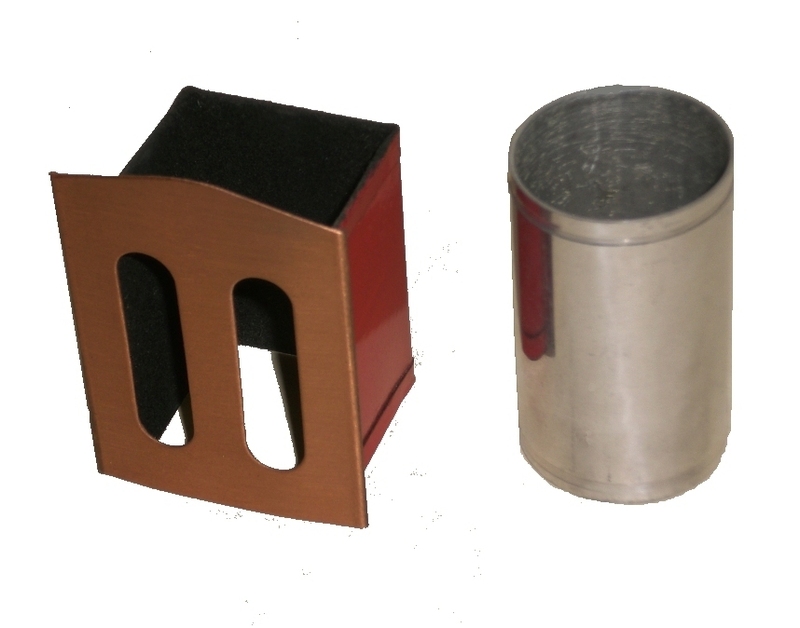 75.00 A small metal box and a metal tube are shown empty, then nested. Immediately a twelve inch silk is produced form the tube. A moment later, the silk vanishes and the equipment can be passed for examination! Thus says the instructions that come with this very well made Merv Taylor product. The instructions give Sid Fleishman and Jack Leuken credit. It is the cutest little Square Circle that you will ever see. This item is in mint condition and is highly desirable for its collectability. Very nice, and only one available.